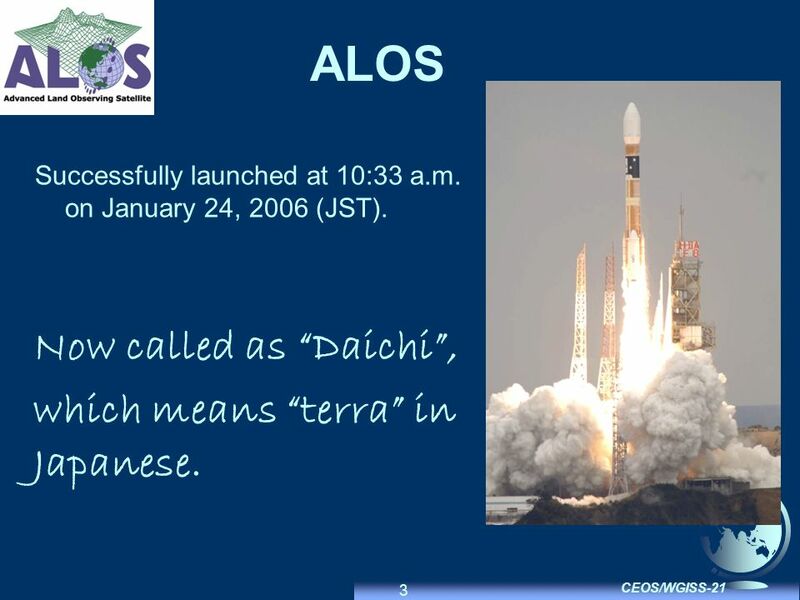 3 3 CEOS/WGISS-21 ALOS Successfully launched at 10:33 a.m. on January 24, 2006 (JST). Now called as Daichi, which means terra in Japanese. 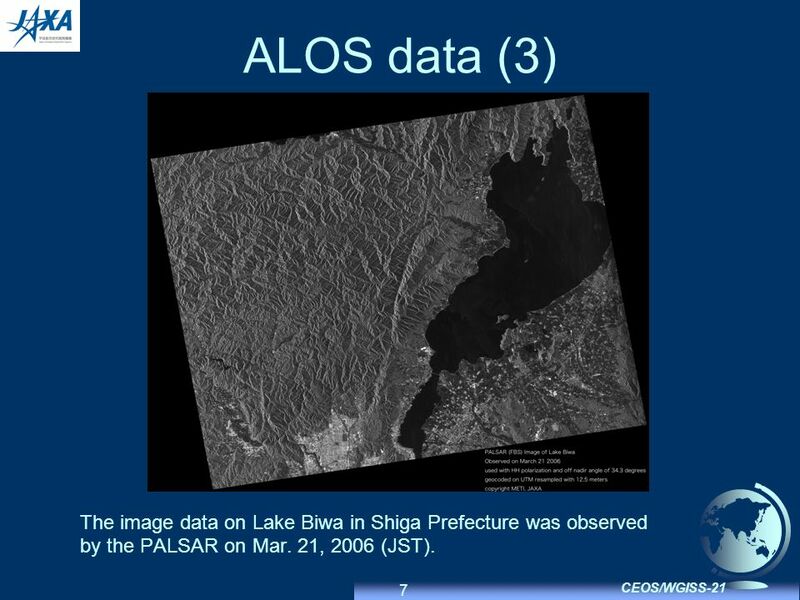 7 7 CEOS/WGISS-21 ALOS data (3) The image data on Lake Biwa in Shiga Prefecture was observed by the PALSAR on Mar. 21, 2006 (JST). 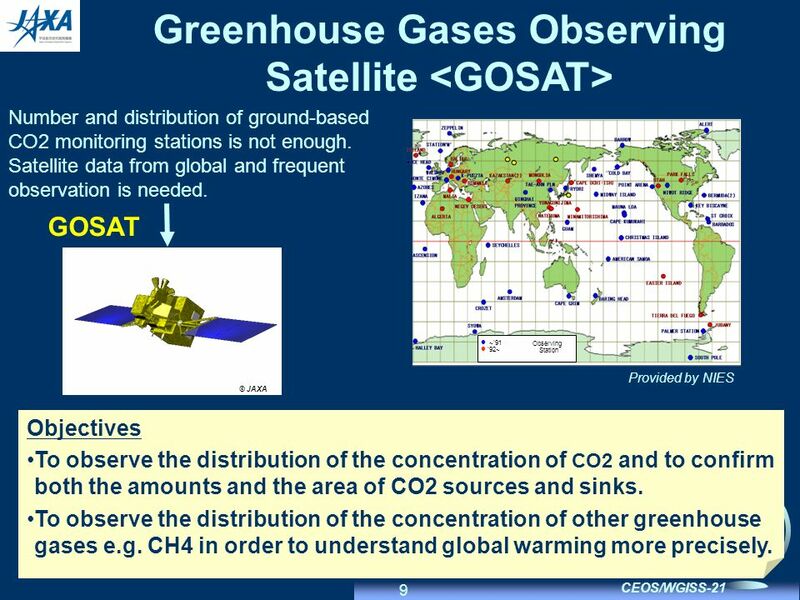 9 9 CEOS/WGISS-21 Greenhouse Gases Observing Satellite Number and distribution of ground-based CO2 monitoring stations is not enough. 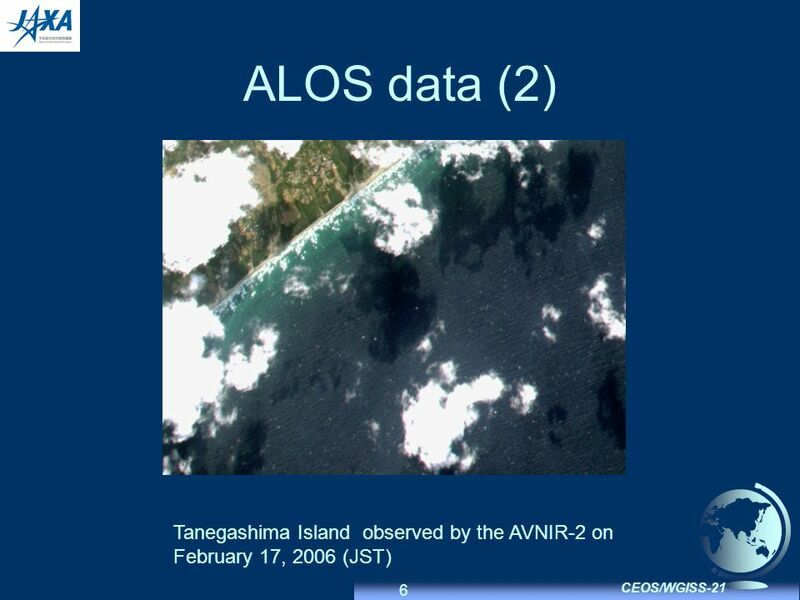 Satellite data from global and frequent observation is needed. 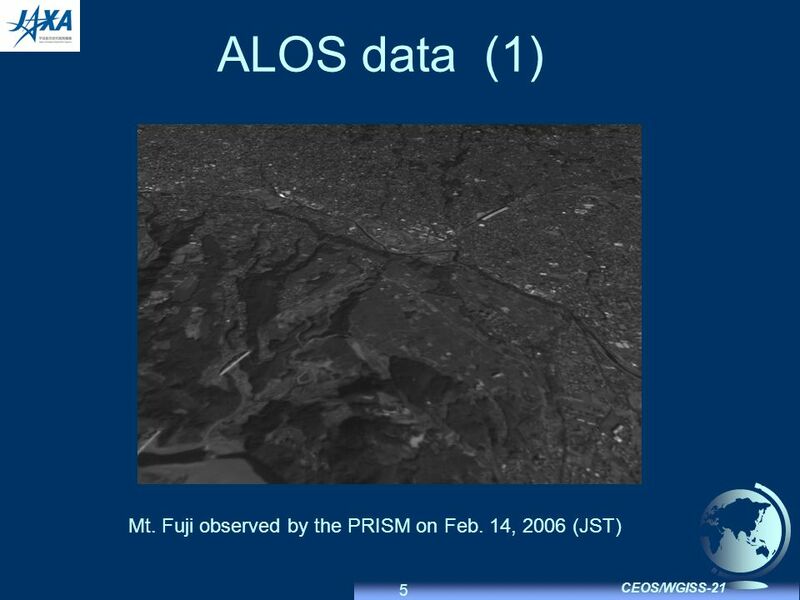 ~91 92~ Observing Station Provided by NIES GOSAT © JAXA Objectives To observe the distribution of the concentration of CO2 and to confirm both the amounts and the area of CO2 sources and sinks. 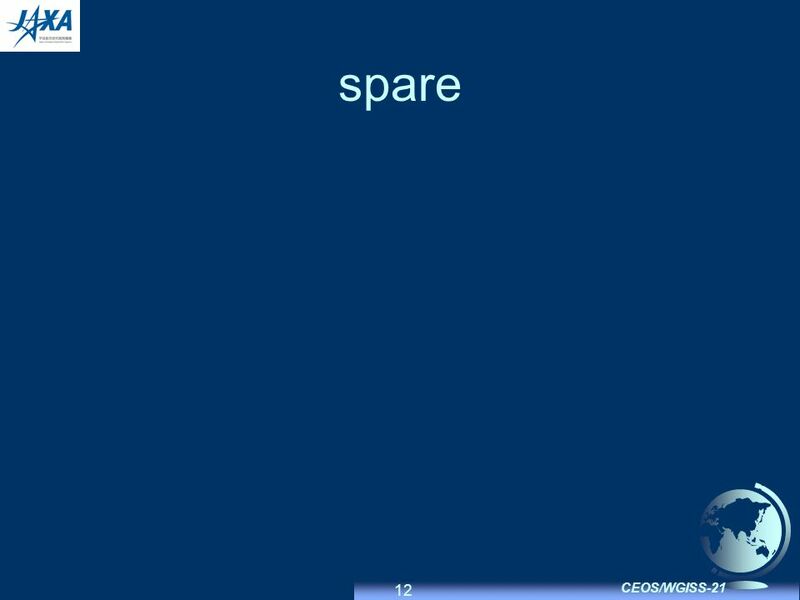 To observe the distribution of the concentration of other greenhouse gases e.g. CH4 in order to understand global warming more precisely. 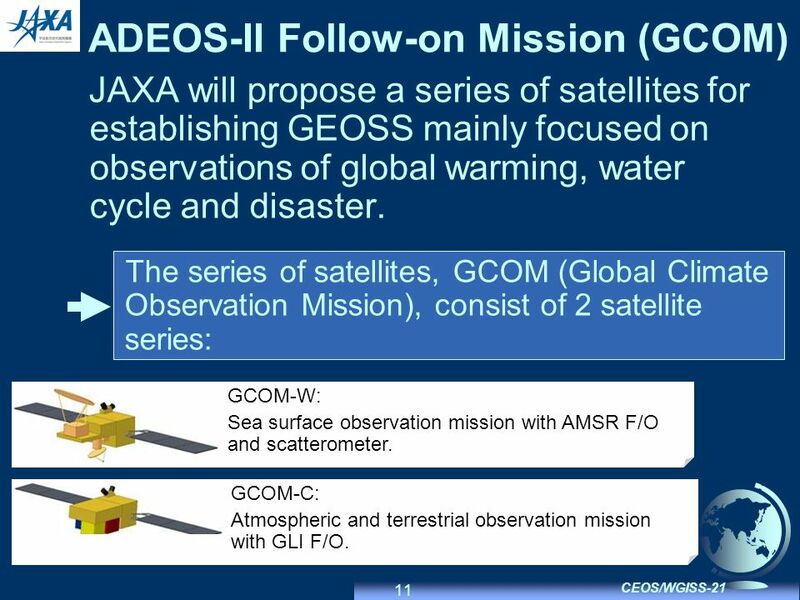 11 11 CEOS/WGISS-21 ADEOS-II Follow-on Mission (GCOM) JAXA will propose a series of satellites for establishing GEOSS mainly focused on observations of global warming, water cycle and disaster. 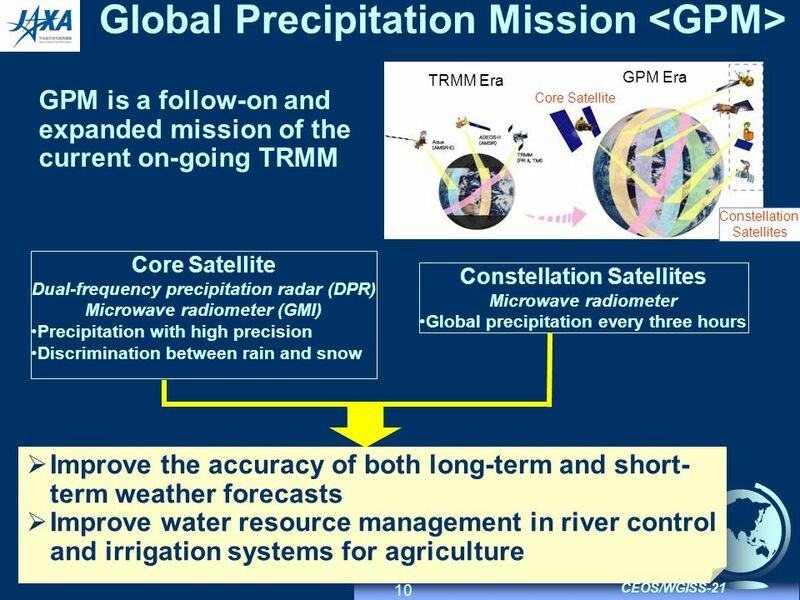 The series of satellites, GCOM (Global Climate Observation Mission), consist of 2 satellite series: GCOM-W: Sea surface observation mission with AMSR F/O and scatterometer. GCOM-C: Atmospheric and terrestrial observation mission with GLI F/O. 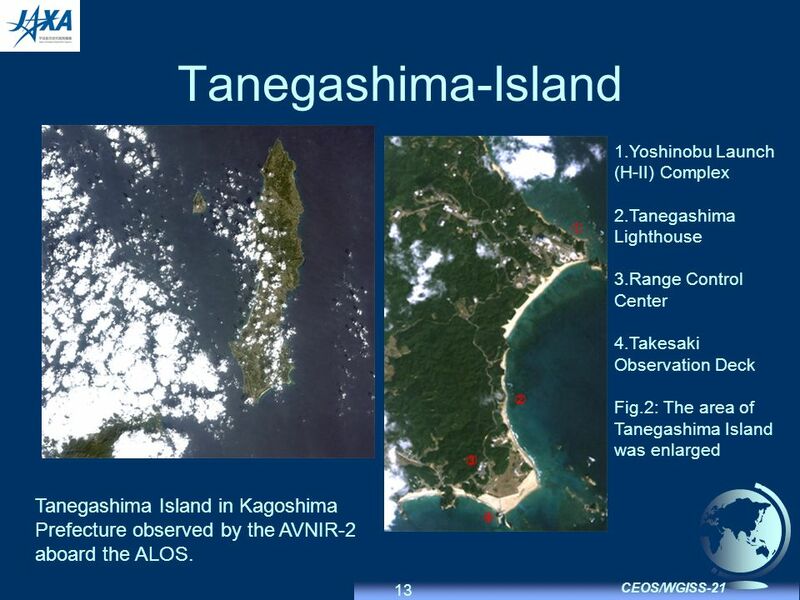 13 13 CEOS/WGISS-21 Tanegashima-Island 1.Yoshinobu Launch (H-II) Complex 2.Tanegashima Lighthouse 3.Range Control Center 4.Takesaki Observation Deck Fig.2: The area of Tanegashima Island was enlarged Tanegashima Island in Kagoshima Prefecture observed by the AVNIR-2 aboard the ALOS. 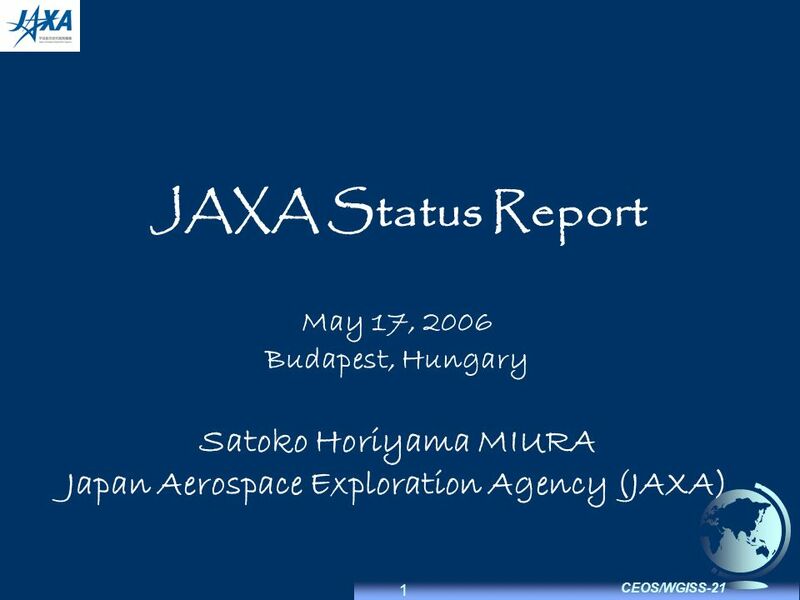 Download ppt "1 CEOS/WGISS-21 JAXA Status Report May 17, 2006 Budapest, Hungary Satoko Horiyama MIURA Japan Aerospace Exploration Agency (JAXA)"
Weather Forecasting This chapter discusses: 1.Various weather forecasting methods, their tools, and forecasting accuracy and skill 2.Images for the forecasting. 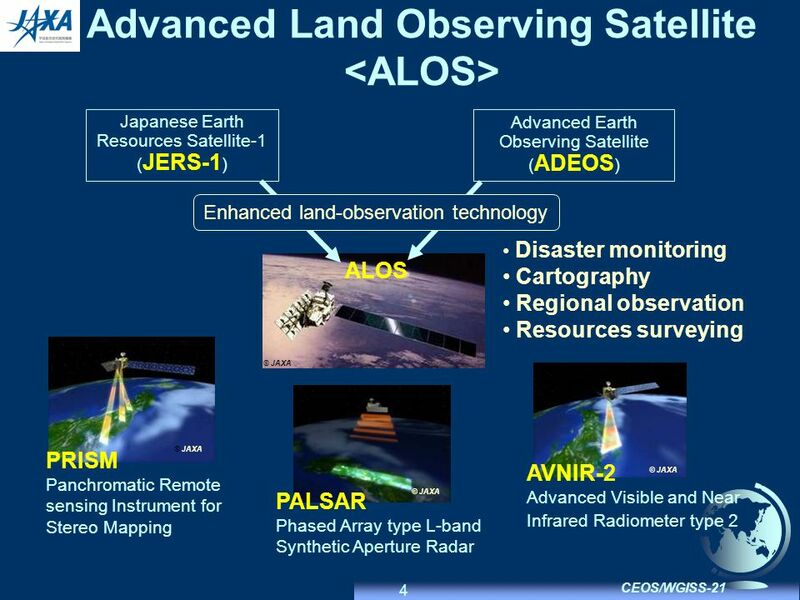 ALOS Introduction JAXA/EORC. ALOS (1/2) Spacecraft MassApprox. 4 tons Generated PowerApprox. 7 kW (at End of Life) Design Life3 -5 years Orbit Sun-Synchronous. Lets go back to Asia How about 23 rd WGISS in Hanoi ? Osamu Ochiai, JAXA Le Ming, VNRSC Pakorn Apaphant, GISTDA. Page 1 GEO/CEOS-SIT Call to Action Ken McDonald WGISS Vice-Chair. CEOS/WGISS, Cordoba, March 7-11, WTF-CEOP/WGCV WGCV/WGISS Collaboration March 9, 2005 Osamu Ochiai - JAXA Ben Burford - JAXA/RESTEC. 1 CEOS/WGISS-20 JAXA Status Report September 16, 2005 Kyiv, Ukraine Satoko Horiyama MIURA / JAXA Hurricane KATRINA :23-03:27 (UTC) A Horizontal. 1 JAXA Agency Report May 25, 2007 Satoko Horiyama MIURA JAXA/EORC May 25, 2007 Satoko Horiyama MIURA JAXA/EORC. 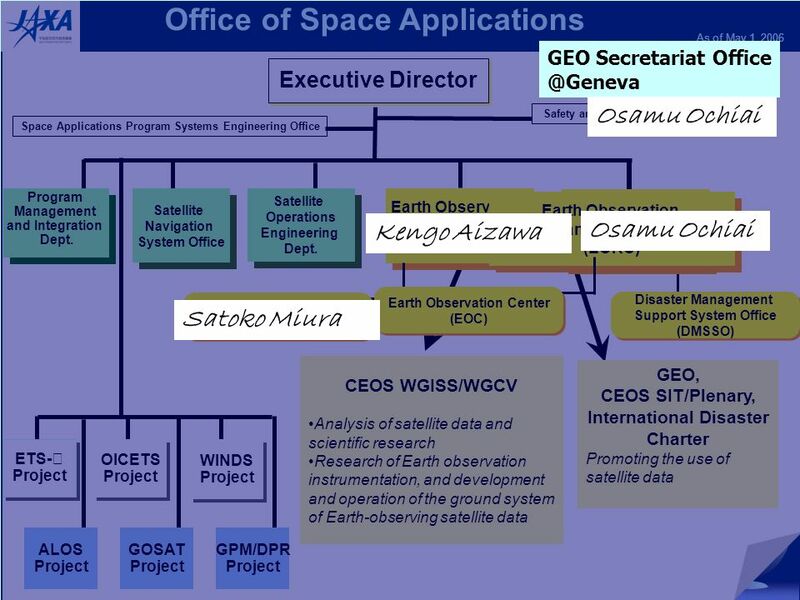 1 Status of JAXA Earth Observation and Next Step as of latest 07 Status of JAXA Earth Observation and Next Step as of latest 07 Mitsuhiro TSUCHIYA Earth. The WMO Vision for Global Observing Systems in 2025 John Eyre, ET-EGOS Chair GCOS-WMO Workshop, Geneva, January 2011. World Meteorological Organization Working together in weather, climate and water WMO OMM WMO Barbara J. Ryan Director, WMO Space Programme. JMA Takayuki MATSUMURA (Forecast Department, JMA) C Asia Air Survey co., ltd New Forecast Technologies for Disaster Prevention and Mitigation 1. CLIMATE MONITORING FROM SPACE -- challenges, actions & perspectives Yang Jun China Meteorological Administration WMO Cg-XVI Side Event An architecture. Slide 1 The Role of Remote Sensing in Disaster Management, Dec. 11, 07, G. Séguin Use of Satellites for Risk Management A key task of the GEO Workplan. ECMWF MetTraining Course- Data Assimilation and use of satellite data (3 May 2005) The Global Observing System Overview of data sources Data coverage Data. 2World Best World Best 365 Organization Direct general of National Meteorological Satellite Center (1) Satellite Development and Planning Division. 1EGU 2014-Vienna Austria, April 30, 2014 Erich Franz Stocker PPS Project Manager/Software Architect GPM Deputy Project Scientist. WMO Space Programme Discussion with IPY-SPG Barbara J. Ryan Director, WMO Space Programme 4 February 2009 WMO Headquarters Geneva, Switzerland.